We have fully implement the IS09001: 2008 quality management system. It adopts advanced production equipment and precision detecting equipment, introduces high-tech process and high technology talents to provides powerful guarantee for product development, quality upgrading and management innovation of the company. 2007Yueqing Suntree Electric Co.,Ltd founder,Owen and other 4 partners start with OEM productiong.Factory in 200m2 .total 15 workman. 2009 Yueqing Xinchi Imp&Exp Co.,Ltd built,main for independent export business to australia market. total 2sales. 2010 Suntree moved to a new building in 600m2 to expand produciong line. ATS etc. 2011 DC items produciong line worked,main in DC circuit breaker, DC isolationg switch to meet internationgal market requirement, Then occupied Australia market and others rapidly,Meanwhile,adopted NDT equipments for Dc,HIGH and low temperature environmental testing equipment. 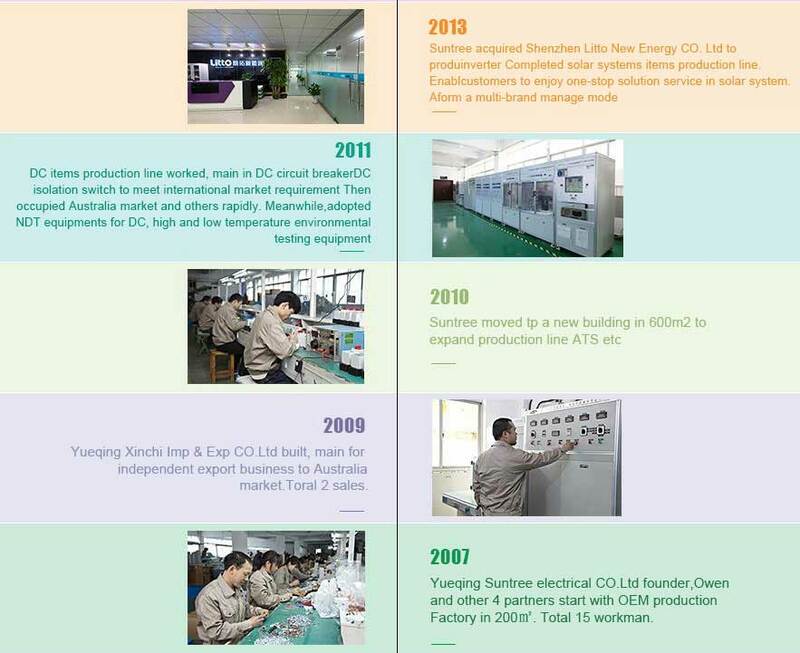 2013 Suntree Acquired Shenzhen Litto New Energy Co.,Ltd to power inverter. completed solar systems items production line, enabi customers to enjoy one-stop solutiong servirce in solar system.aform amulti-brand manage mode. 2014 SET up amunicipal inspection center,moved into the new factory area in 6000m2 and formed 3 system ports,mainly based on photovoltaic system.intelligent distributiong system and power grid system,also introduced fully auto mated production line. 2015 Suntree became a state-level high-tech enterprise. Distributed iport and export branches globally.Exclusive agents or subbranches established in philippines ,sweden,australia,armenia and other countries. 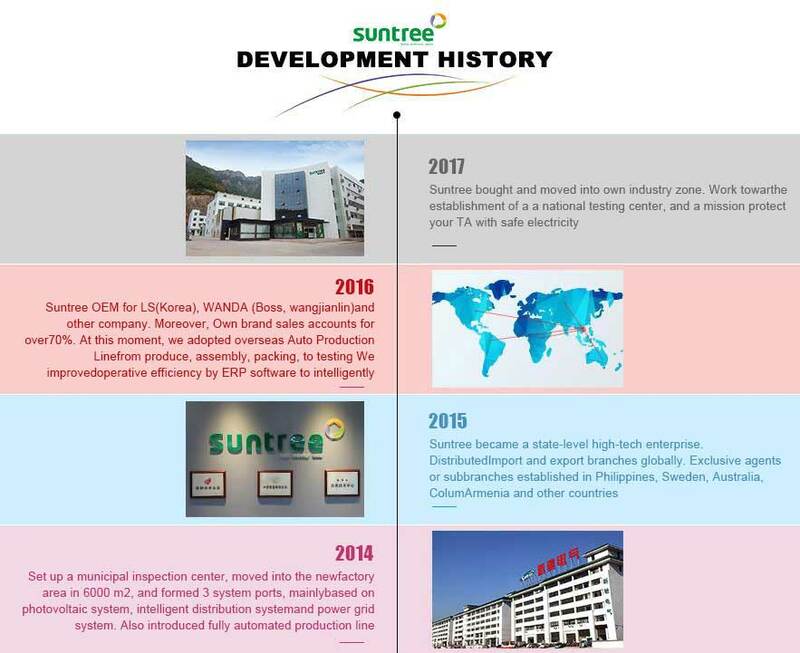 2016 Suntree oem for ls(korea)WANDA(boss,wangjianlin) and other company.Moreover,own brand sales accounts for over 70%,AT this moment,we adopted overseas auto production line from produce, assembly,packing ,to testing.We improved operative efficiency by ERP software to intelligently manage prices and stock. 2017 Suntree bought and moved into own industry zone. work towan the establishment of a a national testing center,and amission protect your ta with sage elecrricity.